Just got an update via Dan Green about the upcoming September 11th card for the Fight Sports Champion Trophy event. The 8-man tournament for £10,000 will also feature some championship titles at stake. The formerly titled MSA team will bring this event to NIA in Birmingham, UK. Current IKF World and WMC European Champion Damien Trainor is set to fight on WAKO-pro world champion Gianpietro Marceddu from Italy. Current WMC European Champion and British ranked number one Dean James will have the toughest test of his career against the experienced Penphet Sor Kittishai of Thailand who has over 80 fights to his name. Dean James is rated as pound for pound one of the most technical fighters in the country! Sunny is a 3x champion who will be fighting his former training partner Raj Sallan. Other fighters are expected to be announced. VIP seats include a two course Thai meal served ringside, complimentary champagne and special VIP entrance. 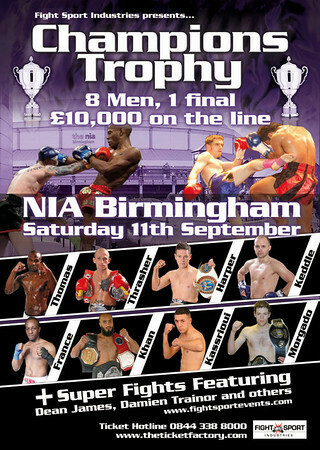 For further details check out http://www.fightsportevents.com or for tickets call 0844 338 8000 or go to: ticket factory’s site. Could be interesting to see by luck of the draw if we could see a Kieran Keddle and Imrhan Khan rematch. Khan was last seen internationally competing in the 8-man Toyota Cup event held in Thailand. That’s quite a christening for Fight Sport Industries’ first event. When the draw’s announced it could be intriguing to see who even makes it to the semi-finals.